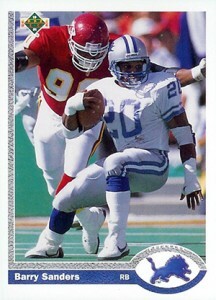 Just like they did with baseball in 1989, 1991 Upper Deck Football helped bring about a major change in football cards. The card maker's debut gridiron set led the charge in giving football cards a premium makeover. And while they may not be worth much today, it doesn't take away from the way the set looks. The base set is big, coming in at 700 total cards. The first 600 are considered the Low Series while the last 100 are High Series. Todd Marinovich didn't work out for the Raiders but another rookie quarterback did. 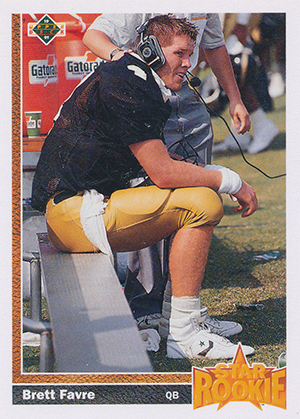 Brett Favre leads the set's rookie cards. There are lots of them, but none have nearly the amount of appeal as the future Super Bowl Champion. The white-border design isn't complex but the glossy card stock and bright images make them instantly standout when compared to the year's other football sets. Backs offer a second action shot to go along with the stats. Mimicking other sports, both Low and High Series packs have an SP insert. 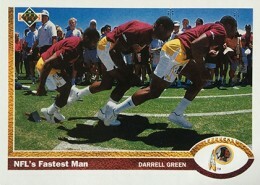 SP1 features a multiple-exposure shot of Darrell Green shooting out of the gates en route to becoming the NFL's fastest man. 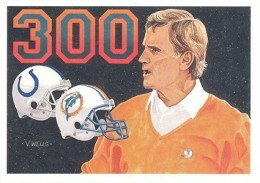 SP2 is a card commemorating Don Shula's 300th win. 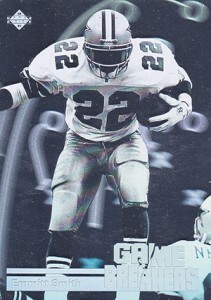 The most recognizable inserts are the Football Heroes. 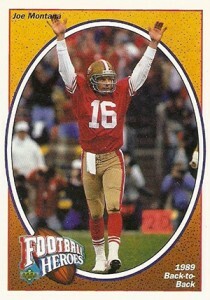 Joe Montana's career is featured in the first group of cards, which are in Low Series packs. 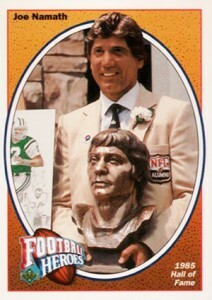 Joe Namath was added in the High Series. Both players have nine cards plus a short-printed Header and an autograph that's limited to 2,500 copies. That may sound like a lot, but given the massive print run, they were both extremely tough to pull. 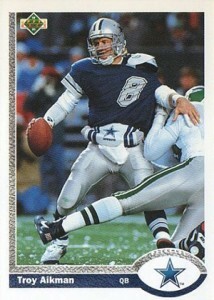 1991 Upper Deck Football also has nine Game Breaker holograms. These aren't at the level of future Upper Deck holograms. Not tough to find, they don't command a lot of attention today. 1991 Upper Deck Joe Montana Autograph (2) Card Set #122 With Cert. Joe Montana in Low Series packs. Joe Namath in High Series packs. 1991 Upper Deck Football High Series Box (36 Pack) Find the "Namath"
1991 UPPER DECK FOOTBALL FACTORY SET NEW IN SEALED BOX.